He began playing football at 7, and at 22 years of age he was already involved in coaching. His dreams came true when he took over U21s of FK Smederevo (formerly known as Sartid) – the club where he was brought up as a footballer. Self improvement, education and willingness to succeed took him to China, a country where football is in expansion. He joined the Sportifico network in February last year, and these days he’s been beefing up his CV with results from his Elite Minhang Team. He is 29 years old, he owns a UEFA A licence and his name is Dušan Rašović. He developed affection for the beautiful game in his neighborhood. He would chase the ball with his friends from morning until dark. It was only logical to join a team, and FK Sartid was his choice. At that point he already knew what he wanted to do following his playing career, and his injury only sped up the process. In my first season I was adapting to the new position and new responsibilities, but the results were satisfactory. His next challenge was working with the senior squad. 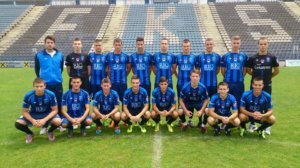 Responding to the invitation from Dragan Paunović, one of Sartid’s prominent players, he moved to FK Mihajlovac where he worked as an assistant coach. His experience in being both the head coach and the assistant coach helped him realize how important this relationship is for the team to prosper. 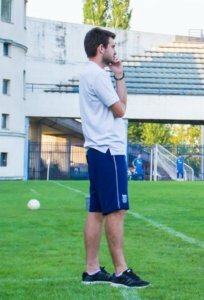 Following his stints with FK Železničar and FK Mihajlovac, Dušan’s wish to return to his club FK Smederevo came true, this time as a coach. Working with U17s and U21s, he’s done a great job and prepared many of them for first team action. However, Shanghai sent him the offer he couldn’t refuse. 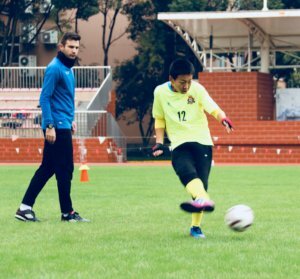 Dušan is a head coach with U15 Elite team of Minhang district that counts over 2 million residents. Despite a huge gap in quality and understanding of football, he adapted quickly. Just like China, Dušan dedicates his attention to education as well as he owns a UEFA A licence. As both a player and a coach, he is aware of how important it is to improve on a daily basis. Dušan has a message for all of his current and future colleagues who get into coaching early.